The @ thing is quite handy. Reminds me of Twitter! Totally agree. I wished for that feature not long after I joined. Now it's here. @ is a great idea. Thumbs up is good to the extent that you can quickly tell someone you're in agreement or that you think it's an interesting post without necessarily having anything more to say about it. 'Thumbs down' is a bad idea. If you care enough to criticize, then take the time to write out your position. "Thanks" is good, but 'thumbs up' even better if you have to choose between the two. @Into the Sky with Diamonds The thanks button does the same as a "thumbs up" would. Well, they're similar, but the way I see it the 'thanks' is to tell someone their post was useful to you, and the thumbs up would be to let someone know you're in agreement, that their post was funny, etc. I agree the thumbs down is a bad idea, though. I can't really see any good it'll do. The birthday greetings to forum members are being consolidated into The Birthday Topic! thread. Just wanted to let everyone know in case they get some PM's talking about posts being moved. Well then it's a good thing Joe never said he was going to put it in, isn't it. I thought Joe asked us about it and everyone was giving their opinions. Looks like you can't. Maybe there should be an Unthank button too, or clicking again removes the thanks. I'll see if I can request the option. There's also a forum plugin that allows thumbs up/down ratings on posts. Would that be useful to people, or just extra clutter? Oh, OK then. I'd say its a bad idea too. No, he didn't. He didn't say he wasn't either, though. Edit: I see that mmm copied Joe's post. OK, thumbs up/down won't happen. No need for any more feedback on that matter! I may be able to change the star on the Thank button so it's a thumbs-up. I'll see. I've also requested that we be able to remove thanks left in error for someone, by pressing the button a second time. Not sure if it's possible. Another new thing: users on a mobile phone should see a slightly different design - I added a mobile-friendly theme. The navigation is slightly different and it'll take a bit of getting used to, but should be more efficient. If you spot problems please add them to the Weird Things Happening thread. It makes it a lot easier to post on mobile... Ill have to get used to the navigation though. I figured out that I can attach a picture that I had previously uploaded using my pc to a post using my phone. Has anyone figured out how to upload a picture to the BB system using their phone? Is the layout of the forum different? The Solo Beatles sections are now below Pics, Books etc whereas i'm convinced they were above previously being immediately below The Albums. 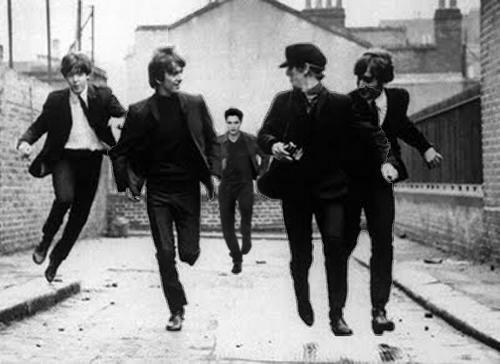 I keep going up to the top for the solo Beatles and then wonder where they are. What is the secret, @Starr Shine? ? Yeah, it seems to be... Least this doesn't cause any kind of problem. On my pc, I did the drag and drop thing to get the file listed in the box and then clicked on start upload. I don't know how to drag and drop with my phone. I tried clicking on add files, but it didn't do anything/give me any options. Any suggestions?